The Bradford District's western boundary (which is also the boundary of West Yorkshire) in a distance or less than six miles displays an interesting succession of marker stones. The aim of this article is to give a brief survey of this county boundary and the boulders and standing stones associated with it. The largest and most remote of the thirteen townships in the ancient parish of Bradford was Haworth, connected with the mother church and Bradford's fairs and markets by a rough undulating road, at times almost impassable. The River Worth formed Haworth's northern boundary, beyond which lay Oakworth, the most westerly of the townships in the parish of Keighley. To the south of Haworth was Wadsworth, one of the thirty-four townships in the great parish of Halifax, the largest in the West Riding. Between the river and its southern neighbour, Haworth narrowed to a neck of land rather more than a mile wide, leading into an indeterminate frontier around Crow hill at the head of the Worth valley. In 1614 common land in the West Riding was conveyed to four men representing the thirty Freeholders of Oakworth, who soon found themselves in conflict with the powerful Duchy of Lancaster and its tenants regarding the location of the boundary line between them. Of course it was a County, as well as a Duchy and manorial issue. The debatable territory on the south followed the stream running down through Watersheddles into Old Snap Clough. The eastern line ran northwards from this stream to the Wolf Stones, and from there the northern limit aimed for the Laneshaw Brook. Finally a western line ran south from the Laneshaw Brook to an intersection with the stream first mentioned. This land was described as 'lying between the Great Law in the west to the Two Laws in the east'. The Oakworth freeholders claimed this land as lying on the Yorkshire side of the watershed, but the Duchy would have none of it. The Chancellor of the Duchy, then as now a member of the Government, initiated a series of tour commissions who heard depositions from both sides as to who had repaired the road and herded the cattle, and where, in times past. In November 1618 the fourth commission finally declared in favour of the Duchy, as one would expect. The matter was resolved on the grounds that the vast Lancastrian parish of Whalley had claimed territorial jurisdiction as far east as the Hanging Stone, thus the county boundary was fixed on the Watersheddles Cross. In 1882, after government by a local board for seventeen years, Keighley was incorporated within an arbitrary circular boundary of one mile from the town centre. This obtained until 1895 when parts of the town outside the circle were included. A second enlargement in 1938 took in the Haworth Oakworth and Oxenhope urban districts, Keighley then marching with Lancashire from Wadsworth to the Wolf Stones. At the grouping of local authorities in 1974 Bradford amalgamated with Keighley and other of its neighbours to form a Bradford District in the new county of West Yorkshire. 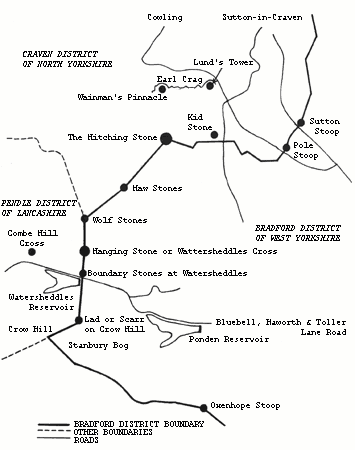 The southern part of Bradford's western limit lies on the 17th century line from Crow Hill through Watersheddles to the Wolf Stones, from which Lancashire's boundary with Cowling continues as before in a north-westerly direction to the Laneshaw Brook. North-east of the Wolf Stones, the former division between Oakworth and Cowling with Sutton-in-Craven, takes on a more important status us a county boundary between West Yorkshire and North Yorkshire. The six miles of Bradford's western limit from Wadsworth to the Sutton-Goose Eye Road is punctuated by a fine series of marker stones. At an angle in Bradford's boundary with Pendle there is a stone with a pointed head and the incised words LAD OR SCARR ON CROW HILL A story is told (with variations) about a boy (or a man) who lost his way in bad weather and died of exposure on Crow Hill, his remains being subsequently buried on the spot. Haworth and Trawden both disclaimed liability, but in the event Trawden undertook the interment and then claimed an adjustment in its boundary to take in the land as far as the stone. Although there is a 'kink' in the boundary, this appears to be another apocryphal tale of tragic death and burial in a remote place. Excavation would settle the matter. 'Lad' is a word occasionally used for a standing stone, of which we have a local example in the Lanshaw Lad, a boundary stone on Ilkley Moor. A group of stones mark the county boundary at Watersheddles. To the north a narrow boulder with its long axis at right angles to the road probably dates from the 1618 settlement. Alongside it is a round-topped stone of grit, a type commonly used to mark boundaries and indicate distances. Both the above stones are 'dumb', that is without inscriptions. A modern stone of concrete with a segmental top indicates LANCASHIRE YORKSHIRE, and at the opposite side of the road a concrete stone of similar shape indicates KEIGHLEY BORO TRAWDEN UDC, obviously a post-1938 provision. In addition to the stones, a Bradford District sign stands a few feet within the boundary on the north side of the road. On the other side an oval sign bears the words BOROUGH OF PENDLE, and over this a recent sign indicates the twinning of Pendle with Creil in France. All told six markers are to be seen here, a lavish provision on an unclassified road. Up on the moor at Watersheddles, a furlong north of the Blue Bell road, is the ancient standing stone, leaning or hanging at an angle of about 45 degrees, as it has done for centuries. On its west face at some date after the settlement of the boundary dispute in 1618 were incised the words HANGING STONE OR WATERSHEDDLES CROSS. No doubt at the same time the cross couped (a plain cross with the vertical arms slightly longer than the horizontal ones) would be cut on the flat top. The stone can just be seen from the road at the head of a straight wall running up the hillside. Beyond the Hanging Stone the line runs due north to the Wolf Stones, a prominent outcrop of rock, and then turns north-east to the Maw Stones a smaller outcrop. Beyond the slight angle at Maw Stones a straight length leads to the Hitching Stone. Splendid indeed is the Hitching Stone, reputed to be Yorkshire's largest boulder. Estimated to weigh 1,000 tons, it measures 29 feet long, 25 feet wide and 21 feet high. This mighty stone undoubtedly glacier borne, almost certainly had its place of origin on Earl Crag, a gritstone escarpment a mile away to the north. It stands at an elevation of 1180 feet. Cowling, Sutton and Keighley meet here, as do the wapentakes of Skyrack and Staincliffe. Could this impressive flat-topped stone, a conspicuous object on a featureless moor, have been a meeting-place of the local Moot or Thing? It is possible because both Anglo-Saxons and Scandinavians adopted such natural sites for tribal purposes. From the Hitching Stone there is an excellent long view of two man-made landmarks on Earl Crag. At the west end of the crag, overlooking Cowling, is an obelisk, Wainman's Pinnacle which was built early in the 19th century and rebuilt in its closing year. Exactly half-a-mile away to the east stands Lund's Tower, an excellent structure with an internal staircase giving access to an embattled viewing platform. This was built late in the same century by James Lund of Mastiles Hall. What these landmarks commemorate is still a matter for debate. At the Hitching Stone the line turns at right angles to pass less than 100 yards south of the Kid Stone more than half-a-mile to the east, and large enough to serve as a prominent boundary marker. Why wasn't it used for this purpose? Over a mile cast of the Kid Stone is the Pole Stoop, another 'hanging' stone, standing or leaning in the corner of a field a few yards in from the north side of the Green Sykes to Cowling Road at the point where it begins to fall. The length of this straight rectangular stoop is about 7 feet and on its western (narrow) face is incised a small cross flory. A few inches below the cross is cut the letter T, probably the initial of the landowner who erected the stone. A supporting wall is now built up to its foot but originally, in common with similar stones, it would be free standing. Some 500 yards below the stoop is the farm named High Pole. A short mile from the Pole Stoop is the Sutton Stoop, located on the north side of the Goose Eye - Sutton Road, just where it begins to fall steeply to Sutton-in-Craven. The stone is about 4 1/2 feet tall, with a weathered, rounded top in which a cross potent is cut. The word SUTTON appears in the centre of the stone. Probably almost a thousand years separate the formation of the undivided parish of Bradford from the present-day Bradford District. Now as then Bradford's 'Ultima Thule' lies on a salient on the far side of Stanbury Bog. The wheel has gone full circle. J.J. Brigg, 'A Disputed County Boundary', Bradford Antiquary, 2nd series, part 26, 1933. A.D. Sewell, 'The Ancient Parish of Bradford', Bradford Antiquary, 2nd series, part 15, 1911. Ian Dewhirst, History of Keighley, 1974. J.S. King, Keighley Corporation Transport, 1964. Alec Wood (Ed.) Sutton-in-Craven: The Old Community, 1973. A. Jowett and A.B. Muff, 'The Glacial Geology of the Bradford and Keighley District', Bradford Scientific Journal, No. 6, l905.